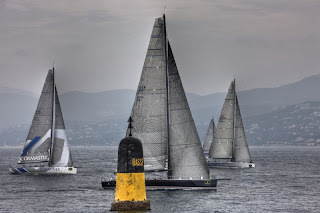 Success was all in the hands of the tacticians aboard the 190 yachts that set out from St Tropez today. After a one-hour postponement, the race committee started the fleet in the lightest of zephyrs. The 4-6 knot northeasterly, though light and shifty, was just enough to get the Maxi and Swan 45 fleet off on their 243-nautical mile journey to Genoa via La Giraglia off the north end of Corsica. For the following two starts, including IRC/ORC A with over 100 boats, the breeze was fickle, dropping even more and making it a struggle for some boats to clear the traffic of the start line. Further out in the bay de Canebiers, the wind picked up slightly; from here the fleet headed to a turning mark at La Fourmigue twenty nautical miles down the coast, and from there turned upwind for the next landfall of the Giraglia Rock, 130nm miles away. Luna Rossa initially led the 25-boat Maxi and Swan 45 fleet upwind shortly after the start, with Bella Mente, Container, and Ran close behind. From Bella Mente, navigator Robert Hopkins reported, "We worked out of the St. Tropez Bay playing the right side as close to the rocks as we dared to pick up what little pressure there was. The course to La Fourmigue opened from Code 0 to A3 reaching, to A2 running in 12 to 15 kts, a beautiful afternoon." Bella Mente rounded La Fourmigue around 2:30pm local time ahead of Ran by 5 minutes, followed by Alegre, Luna Rossa, and Container further back. Hopkins added, "We started a square beat to Giraglia, but now the wind has backed from 85 to 42 degrees after one hour and we are pointing at the mark, expecting light winds until midnight when there may be a band of 15 knots pressure." 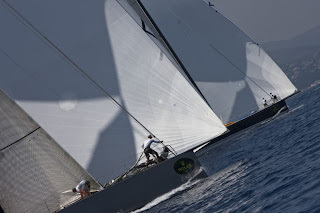 Many in the fleet competed in the Giraglia Rolex Cup inshore races, while others such as Nicola Paoleschi on Sagamore, were here to sail in the Giraglia distance race only. Sagamore, a Sparkman & Stephens 81-foot Maxi, was built in 1995 in New Zealand and campaigned successfully around the world by its' American owner for several years. In fact, he raced Sagamore in the 2001 edition of the Giraglia. Paoleschi, a dentist from Tuscany, is a passionate racing/cruising sailor who has owned a succession of yachts over the years. After taking delivery of Sagamore in the US, he cruised in Maine and Newport, R.I., before putting it on a ship for La Spezia. Paoleschi is partial to the legendary design firm Sparkman & Stephens' yachts - his first boat was a 34-footer from S&S. He recalled, "A friend of mine, Harry Morgan (from S&S) suggested Sagamore to me because it's a fantastic boat to race, as well as to cruise. The interior is very comfortable for a race boat. We can remove part of the interior for racing, and in 1-2 days it can be ready for cruising." Over the past year, Sagamore has competed successfully in races around Tuscany, though this is Paoleschi's first time competing in the Giraglia Rolex Cup. He offered, "I was waiting to have a good boat for the first time. We have a good chance to finish in Genoa in the first group - sure not to win, I don't think so, but why not! We try - the crew are all friends, some with more experience, some others with less experience, and they can learn from the best group, so we are going to improve our crew." Last night at the Citadelle de Saint-Tropez for the Rolex Gala and prizegiving, 2,000 guests enjoyed a delicious dinner and entertainment including opera singers, and a dazzling fireworks display for all of the port to see. Prizes were awarded to the top three yachts from each division for the inshore racing, with the overall winner of IRC A, Grant Gordon and Klaus Diederich's Swan 45 Fever was awarded a Rolex Submariner timepiece. In ORC B, Federico Massari's Grand Soleil 34 Mariel won overall and received a Rolex Submariner timepiece. 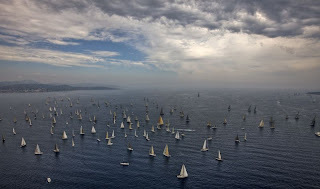 Information on the Giraglia Rolex Cup, including full race results from the inshore racing can be found at the Yacht Club Italiano's website at Italiano www.yci.it.